2012 Drummer Magazine (100) Interview with Chad Smith about playing in the band and a two page spread on Chad’s drum kit with comments by Chris Warren. 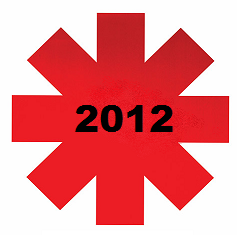 2012 January Rolling Stone Article about RHCP being inducted in the Rock and Roll Hall of Fame in Cleveland, Ohio. Mentions Hillel Slovak. 2012 February Rolling Stone RHCP featured several times in the magazine; photo of Anthony Kiedis surfing in St. Barts and snippet about Red Hot Chili Peppers’ US tour dates being post-poned due to his foot injury; a review of RHCP at the O2 Arena in Dublin and a Q & A session with Flea. 2012 March 6th Billboard Chad Smith interview about John Frusciante not joining RHCP in the Rock & Roll Hall of Fame induction, etc. 2012 April MOJO Magazine Interview featuring Flea about his Rocket Juice & The Moon collaboration with Tony Allen and Damon Albarn.